WASHINGTON -- US Secretary of State Mike Pompeo will meet with South Korean Foreign Minister Kang Kyung-wha in New York on Friday to discuss the latest developments regarding North Korea, the State Department said. Pompeo's trip comes two weeks after he visited Pyongyang to follow up on a nuclear disarmament deal reached by US President Donald Trump and North Korean leader Kim Jong-un at their historic summit last month. 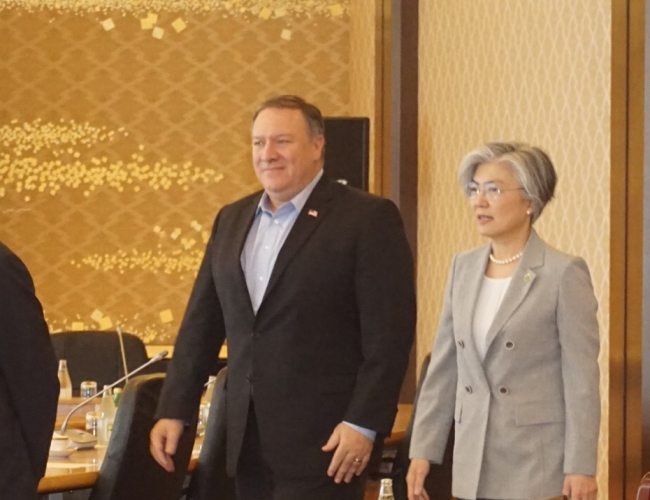 Pompeo then traveled to Tokyo to share the results of his talks with the North Koreans with Kang and Japanese Foreign Minister Taro Kono. "Secretary Pompeo will meet with Ambassador Nikki Haley and members of the United Nations Security Council, as well as Republic of Korea Foreign Minister Kang Kyung-wha and the Japanese Ambassador to the UN Koro Bessho, to discuss the latest on the DPRK," State Department spokeswoman Heather Nauert said in a statement Monday. efforts to negotiate the exact terms and timeline for North Korea's denuclearization.